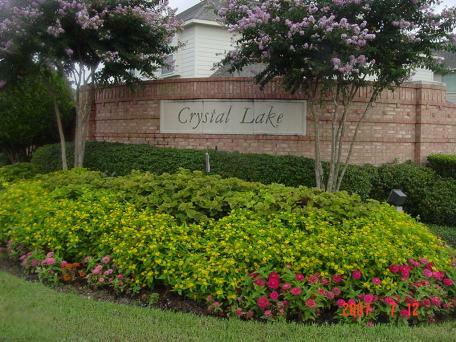 Crystal Lake Property Owners Association is a gated association of 137 homes. The association is located in Pearland just off 288 at the corner of Hughes Ranch Road and Cullen. The Association’s Board consists of five very active and enthusiastic Board Members. The Board continually works hard to keep the association looking great at all times. The Board of Directors has actively enforced the deed restriction in the Association and work very hard with residents to keep the property values high in Crystal Lake. The Association has just completed three very major projects for 2007 and Board Members put 100% of their time in completing these projects. The projects were to install two security cameras at their main entrance, a new telephone entry system for entering gates and had gates sand blasted, power coated, welded where needed and painted. With not only the every day affairs of the Association; the Board has put a lot of volunteer hours to achieve the struggles of the community. C.I.A. Services would like to extend a huge thanks and hats off to the residents for being so patient during this period while the gates were down. Thanks to all volunteers who continue to support the Board in their efforts in making Crystal Lake a wonderful and safe Association for raising children and /or retiring. C.I.A. Services is proud to manage Crystal Lake Property Owners Association and work with such enthusiastic leaders and residents.